Today was a strange little day indeed. First off, I had to wake up at the crack ‘a dawn for an appointment. Much to my dismay, it wasn’t at the typical location which meant that I had to drive all over and PAY FOR PARKING. Very uncool. I had been planning to take Chloe to my gym with me while she was home for break and we decided to do that today, but for some reason, when I got back home this morning, I was so tired that I could barely think about standing up straight, let alone dragging myself through a workout. I bummed around the house, took a nap and then met Chloe for a workout around noon. Of course, as soon as we swiped our cards, I realized that I didn’t have my earbuds and because I have the motivation of a SLUG when I don’t have my jams blasting in my ear, I actually raced home to grab them. The fact that I can only make it about .1 miles without tunes is the perfect illustration of what I have always known: running road blocks are ALL in your mind. Granted, there comes a point where you really are burnt out and simply can’t go on, but that doesn’t happen quickly for most people. When I returned, the floor was packed. It really does something to my mojo when there are people lurking around EVERY corner. I also hate being that person who leaps onto the elliptical/treadmill that is parked between two other people just because it’s the only one free! Despite that, I managed to get a good workout completed that included 20 minutes at a pretty quick clip on the elliptical followed by a cardio/ ab circuit routine and I thoroughly enjoyed both! I intended to complete the Best Body Boot Camp workout today, but once I got to the gym, I realized that there were actually several moves that I had no idea how to do and I failed to look at the demo videos before heading out this morning! I shall try again tomorrow! Next, we decided to try for a walk along the canal path nearby, but unfortunately despite the fact that it was a perfectly beautiful day (perfect for walking outside! 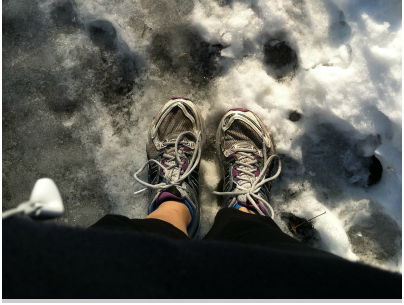 ), the trail was very, very icy and almost impassible so we turned around pretty quickly. Disappointing! Sure, it might not look THAT bad, but trust me. It was quite treacherous! In addition to some broccoli that I “steamed” in the microwave (seriously, those steamer bags are the greatest! ), I also threw a 100-calorie multigrain english muffin into the toaster oven and topped it off with some sauce and cheese. Talk about elementary school throw-back! 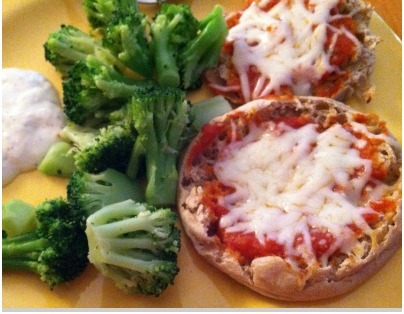 English muffin pizzas, anyone? Delish! This entry was posted in Gym, Healthified Meals and tagged elliptical, English Muffins, gym by 5ksandcoffeebeans. Bookmark the permalink.